Yes, it’s been five months since my last post. As it turns out writing meaningful blog posts is not as easy as I thought! Anyway, I’ve been pretty busy, not only with life and work, but also steadily making progress on COLE-1. Here’s a recap. One of the first things I did once the board was operational was start hacking together support for SPI, which opens up the possibility of talking to a lot of interesting hardware. The 6522 VIA can almost, but not quite, do SPI in hardware, so I ended up bit-banging it myself. The protocol is fairly simple, and is very flexible on clock rate, so this was not hard to do. Owning a logic analyzer (a Saleae Logic 4) also helped immensely. Once the SPI was working my next task was to hook up one of those little $5 SD-to-SPI adapters that you can find just about anywhere on the net. The hardware hookup was easy; the driver software, not so much. It took me a week or so to finally get the driver to properly initialize the card and read blocks, despite having some official documentation and some sample code. Having a small bug in my SPI driver also did not help matters! With the low-level bits of the SD card driver working (at least for reading), I have begun to build a real operating system around that. Tentatively I’m calling it JR/OS (Josh’s Retro Operating System), at least until a better name comes to mind. The plan is to embed the OS in ROM and allow booting applications from FAT-formatted SD cards. Some day I would like to be able to load the OS from disk at boot time, but COLE-1 only has 32K of RAM and a largely empty 32K ROM, so for now JR/OS will remain in ROM. This is where I’ve spent most of my time lately and the part I’m most excited about. For the past few months I have been designing a custom video and I/O chip using a large CPLD (complex programmable logic device). The goal is to provide VGA output, PS/2 keyboard and mouse input, and possibly hardware SPI. It’s slated to eventually be the core of my next SBC, but first I’m going to be hooking it up to COLE-1. Here’s the early prototype hardware. The board on the left is a Max V CPLD development board; it’s hooked up via a ribbon cable to my breadboard which contains the support circuitry to interface to the VGA monitor. The two chips at the bottom of the breadboard are the VRAM, which is not yet connected. This board will get much more full soon. And here’s a 16-color test pattern. The board can actually do up to 64 colors at 320×240 but this pattern was easy to generate. I’ll be making a separate post about this chip soon, because it’s pretty cool and it deserves a post of its own. Stay tuned! Posted in COLE-1, Electronics, Projects on July 12, 2018 by jthompson. 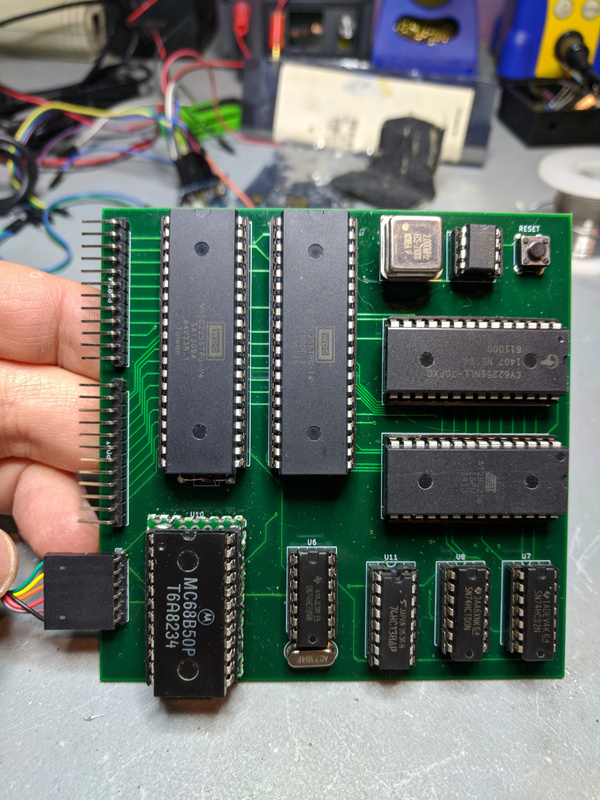 This SBC is based on a WD 65C02 clocked at 4 MHz, with 32K of RAM, 32K of ROM (implemented with an EEPROM, for easy updates), a 6522 VIA driving two 8-bit expansion ports, and a 6850 ACIA providing a TTL-level serial port running at 115.2k bps. 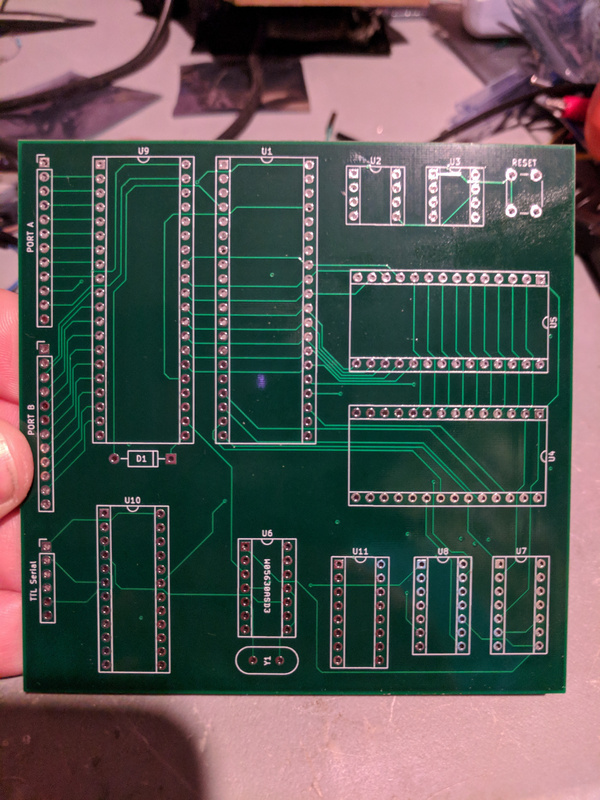 Careful observers will notice that there is solder mask over the pads for my surface-mount components; this is NOT the board house’s fault, because I see the same thing in the gerber file; somehow I goofed up my board layout in KiCad. Fortunately solder mask is pretty easy to remove with a sharp flat-head screwdriver, so I was able to correct this mistake. 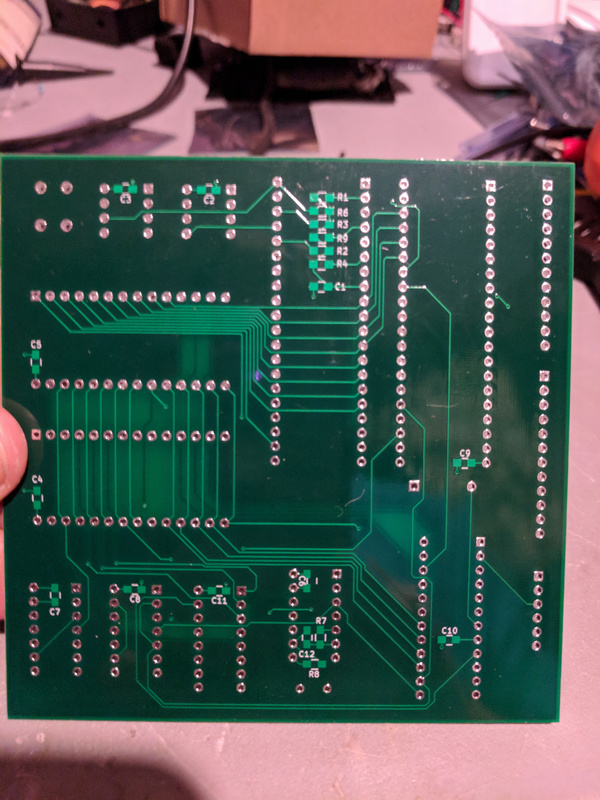 The solder mask problem, however, was nothing compared to the other mistake in this layout: I accidentally picked the wrong footprint for the ACIA, which is the chip at the lower left corner of the board. What should have been a 24-pin, 15mm wide footprint ended up being a 10mm wide variant! Rather than waste the boards I hacked together an ugly but functional adapter using a 24-pin socket, some perf board, and two strips of male headers. This turned out to be more of a pain than I had planned, due to the need to solder in some tight spaces, but I finally got it working and stable. The moral here is always print your layout on paper and do a test fitting with your actual components before sending your layout to the fab house! The firmware for this board is very much a work in progress. The system currently boots into a customized version of Enhanced BASIC; from there, you can run the ‘SYS’ command to drop into my home-brew system monitor. 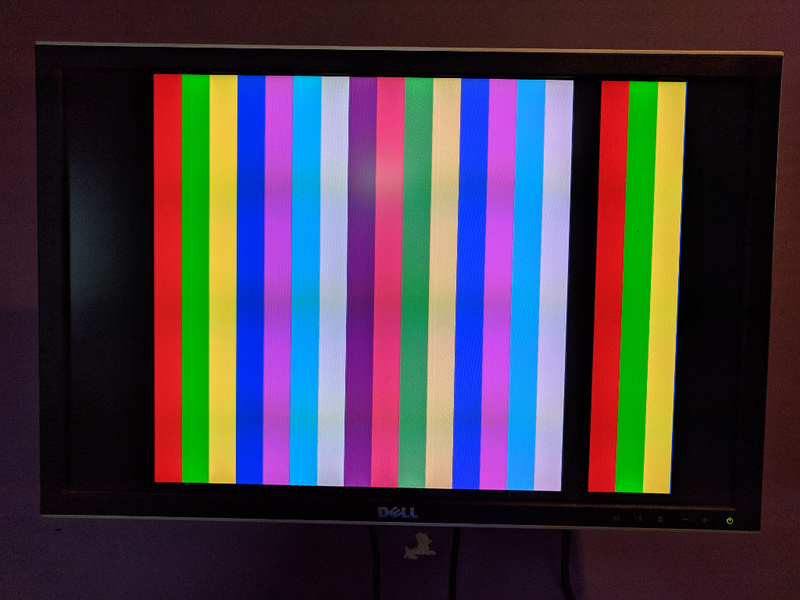 The monitor is loosely based on the Apple II system monitor (since I grew up using it), but currently has only minimal functionality. You can view (but not modify) memory, disassemble code, and do Xmodem transfers to and from memory. The upload function is very handy for rapid testing of new firmware; I can upload and run test code from RAM instead of having to pull the EEPROM and re-program it. 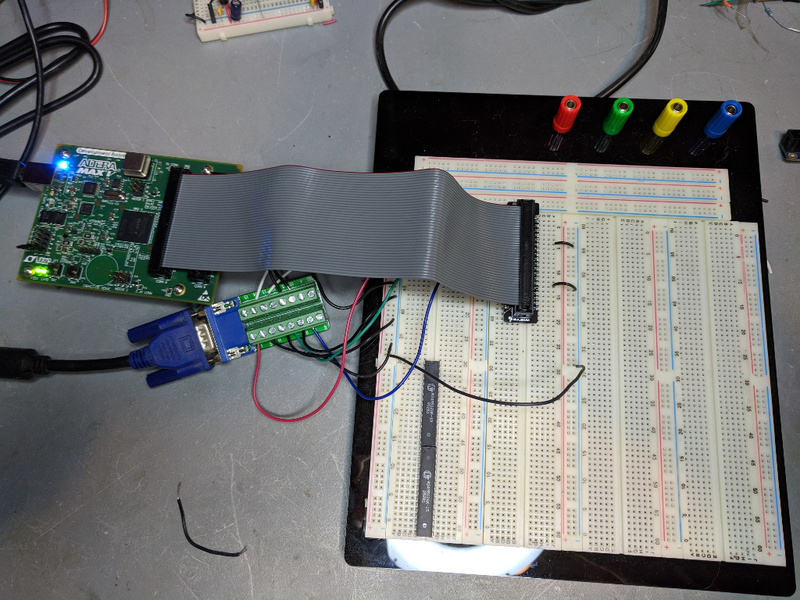 At the moment I am working on designing an add-on board that will provide VGA output and PS/2 keyboard input through one of the VIA ports, using a custom CPLD and an Atmega microcontroller. I’ll be blogging more about that project soon. I have also been experimenting with a microSD card adapter that interfaces via SPI, with the intent of eventually implementing a full disk operating system (probably based on FAT-16). The problem is that my current hardware design doesn’t directly support SPI; I have written some code that bit-bangs it on a VIA port, but it’s not exactly fast, so I am thinking about just tying one port to an atmega328p and using that as a parallel<=>SPI interface to get better throughput. Eventually there will be a COLE-2, probably based on the 65816, and with more integrated peripherals. I had originally intended to start work on COLE-2 once COLE-1 was up and running, but I’ve decided to hold off for a bit and see how much I can add onto COLE-1 first. The schematics, board layout, and firmware source code are all available in my GitHub repository. Posted in COLE-1, Electronics, Projects on February 26, 2018 by jthompson.